Indoor lighting can really brighten a space and make it feel more welcoming, particularly in the darker winter months. But did you know you can make an amazing pendant lantern by hand at practically no cost? 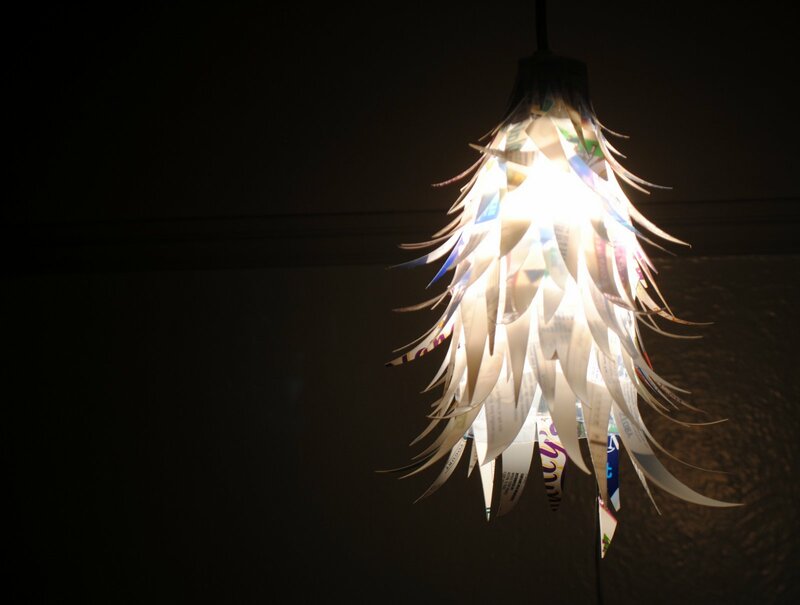 Just follow our original DIY tutorial to create a unique, feathery hanging lantern made entirely from recycled materials for your kitchen table or bedroom. All you'll need are a few plastic yogurt containers and a plastic bottle, as well as a low-wattage CFL or LED lightbulb and cord. The materials you’ll need for this project are simple and easy to source, starting right in your own recycling bin. 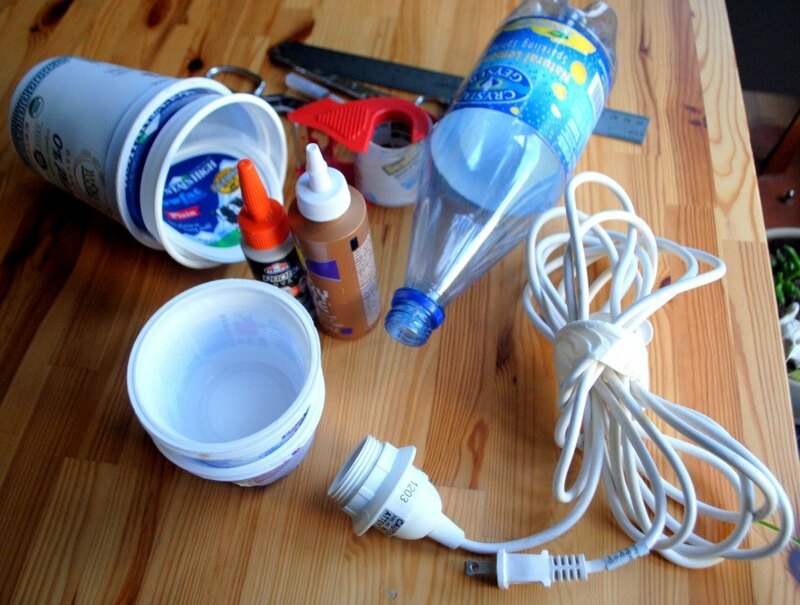 You’ll need: several cleaned white plastic yogurt cups, 1 large clean plastic seltzer or soda bottle, strong glue, X-Acto knife, scissors, masking tape, lightbulb socket with cord, low-watt low-temperature bulb (LED or CFL), and fishing line. The plastic bottle will form the base of your lantern. Using the X-Acto knife, carefully cut off the bottom and the top of the bottle. Make sure the opening at the narrow end is wide enough to thread the plug of the light cord through; trim it wider if necessary. 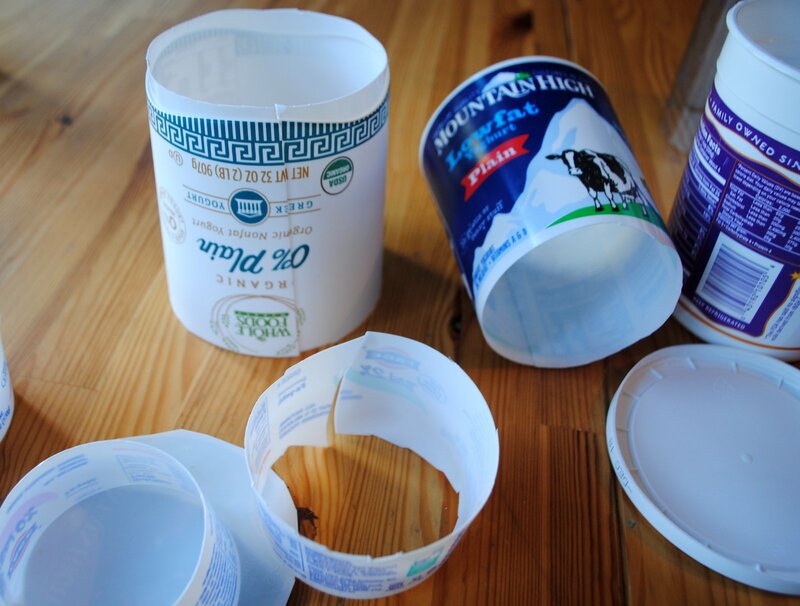 Using clean, dry plastic yogurt cups, carefully trim off the bottoms and the curved edge at the top. Next, slice them lengthwise from top to bottom. Now, begin to cut long triangle-shaped pieces from the plastic yogurt cups. There’s no need to trace or measure – part of the charm of this lantern is the randomly shaped pieces that form a feathery-looking fringe. Make sure some pieces are nice and long. You’ll need at least 130 triangular pieces – a few more if you make the bases narrow, a few less if you opt for wider triangles. Now you’ll need to glue the triangles onto the bottle, which forms the base of the lantern. You’ll notice the triangles curve gently outward due to the shape of the yogurt cup – this helps create the feathery shape of the final lantern. Simply glue each triangle printed-side down, with the point curling outward, away from the bottle. 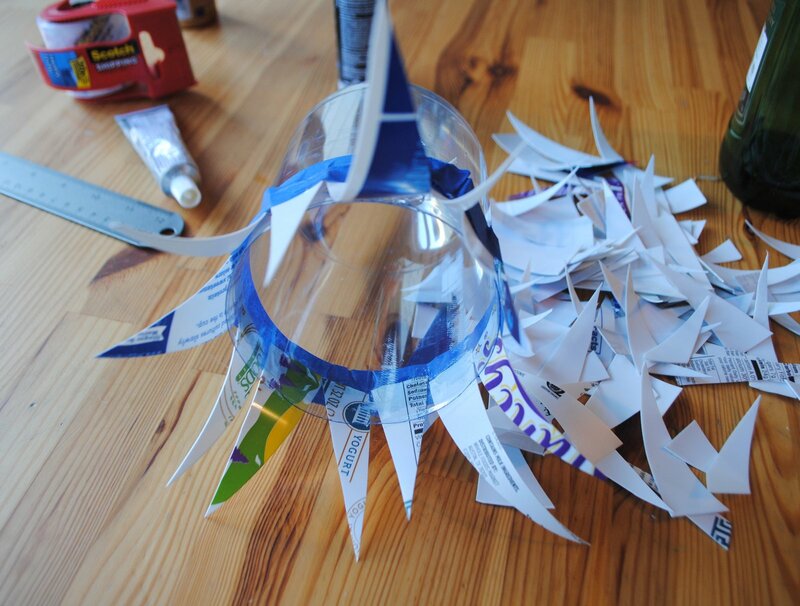 You’ll glue about 9 rows of triangles on the bottle in concentric circles (depending on the size of your bottle). We glued each triangle on, then secured each concentric row of triangles with a strip of removable masking tape. If you are using a hot glue gun, you’ll be able to skip this step as your glue will harden more quickly. If you’re using epoxy or another craft glue, it takes longer to dry so you’ll need the masking tape to secure the triangles in place while they dry. When you reach the top of the bottle’s neck, glue on your final row of triangles. Prop the lantern over a bottle to let it dry overnight. 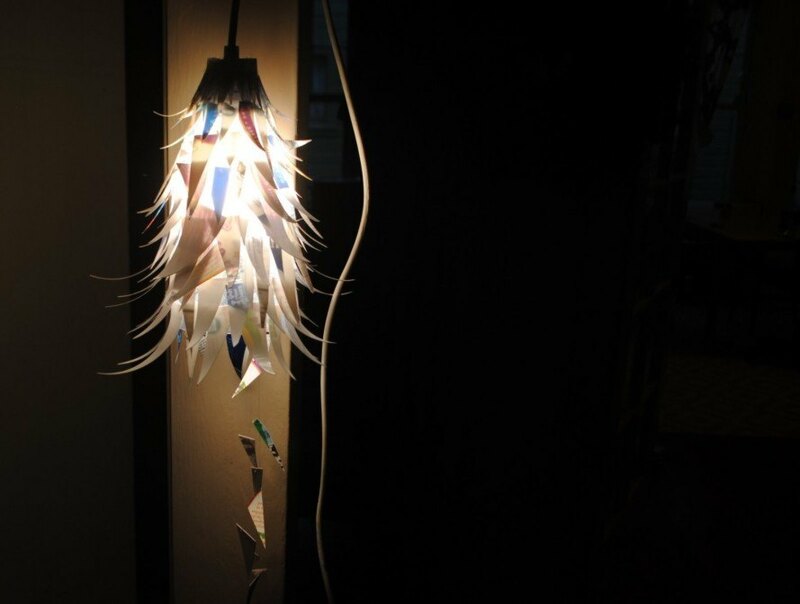 Once the glue has dried, carefully and slowly remove each row of masking tape to reveal the finished lantern shade. Thread the cord through the shade and pull it tight (the narrow neck of the bottle should meet the ring of the lightbulb socket and hold it in place). 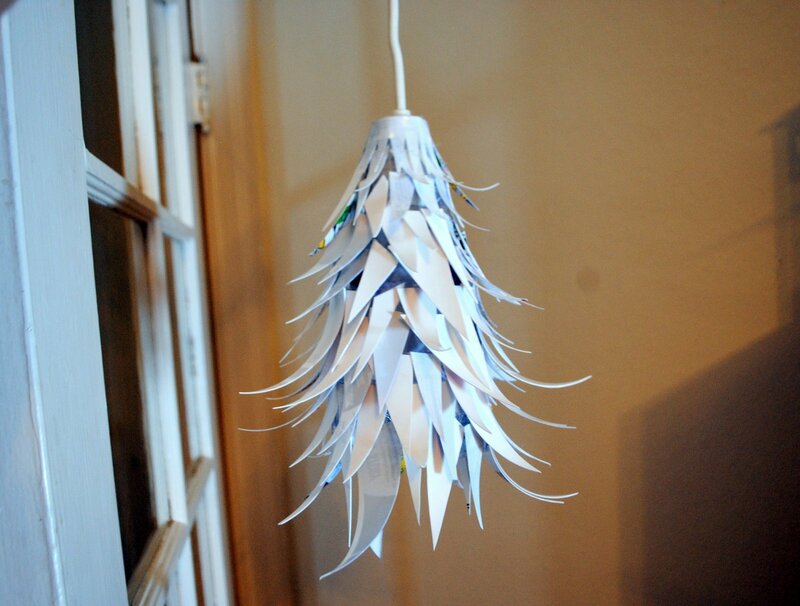 As an optional step, you can add several strands of quirky dangling triangles to hang from the bottom of your lantern like jellyfish tentacles. To make the mobile, thread 3-5 plastic triangles on 3 separate strands of clear fishing line. 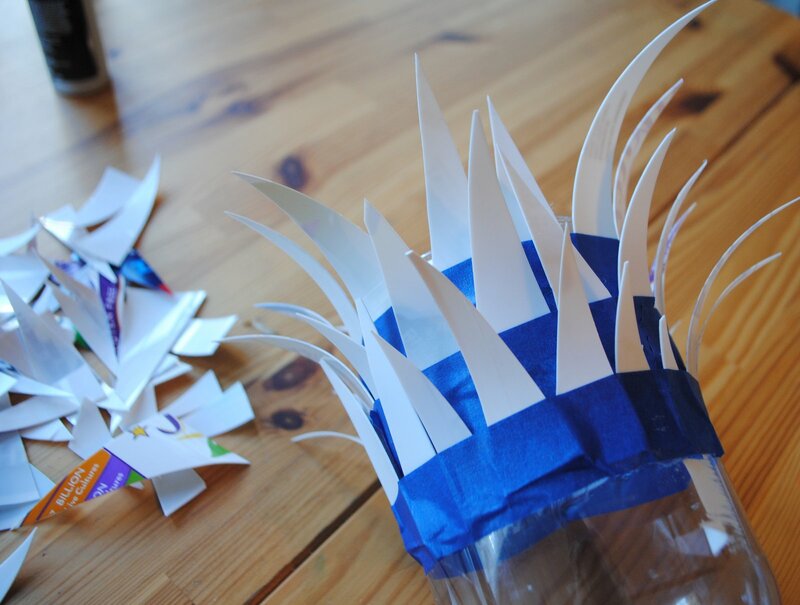 Then, use clear packing tape to secure the mobile strands onto the inside of the bottle, where they’ll dangle freely. Step 8: Add A Lightbulb! Finally, add a very low-wattage LED or CFL bulb to the light socket. This is very important step since a bulb that puts out too much heat could melt the plastic and pose a fire hazard. Now Stand back and enjoy the warm glow of your new handmade recycled lantern. The materials you'll need for this project are simple and easy to source, starting right in your own recycling bin. You'll need several cleaned white plastic yogurt cups, 1 large clean plastic seltzer or soda bottle, strong glue, X-Acto knife, scissors, masking tape, lightbulb socket with cord, low-watt low-temperature bulb (LED or CFL), and fishing line. 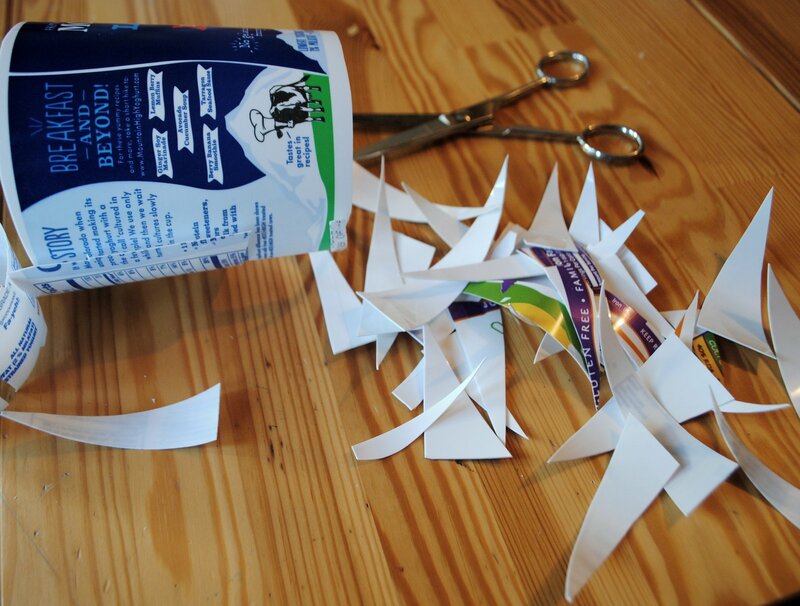 Now, begin to cut long triangle-shaped pieces from the plastic yogurt cups. There's no need to trace or measure - part of the charm of this lantern is the randomly shaped pieces that form a feathery-looking fringe. Make sure some pieces are nice and long. You'll need at least 130 triangular pieces - a few more if you make the bases narrow, a few less if you opt for wider triangles. Now you'll need to glue the triangles onto the bottle, which forms the base of the lantern. You'll notice that the triangles curve gently outward due to the shape of the yogurt cup - this helps create the feathery shape of the final lantern. Simply glue each triangle printed-side down, with the point curling outward, away from the bottle. 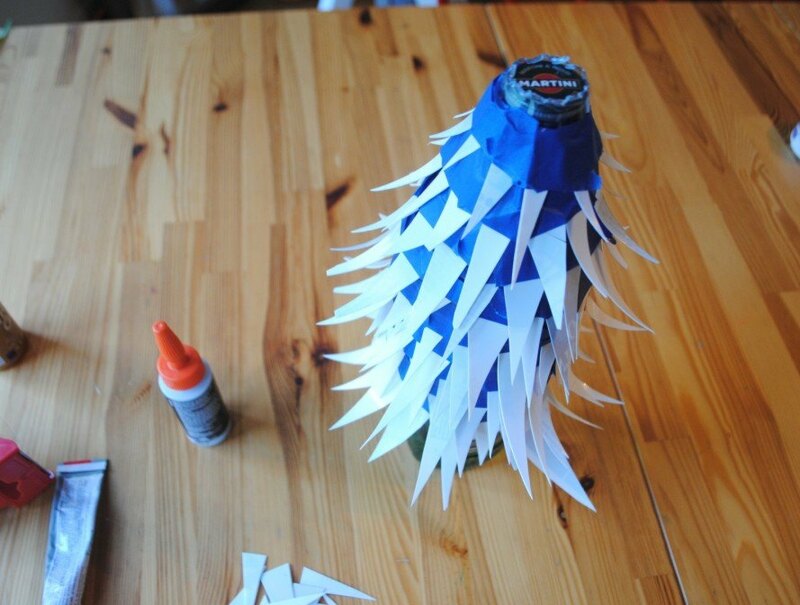 You'll glue about 9 rows of triangles on the bottle in concentric circles (depending on the size of your bottle). Gluing triangles to the bottle in concentric circles. We glued each triangle on, then secured each concentric row of triangles with a strip of removable masking tape. If you are using a hot glue gun, you'll be able to skip this step as your glue will harden more quickly. If you're using epoxy or another craft glue, it takes longer to dry so you'll need the masking tape to secure the triangles in place while they dry. Let dry overnight. As an optional step, you can add several strands of quirky dangling triangles to hang from the bottom of your lantern like jellyfish tentacles. 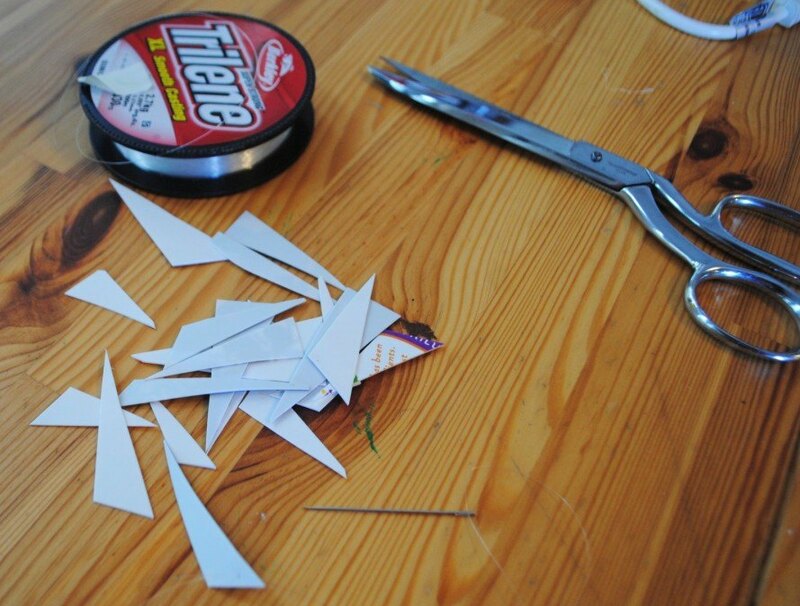 To make the mobile, thread 3-5 plastic triangles on 3 separate strands of clear fishing line. 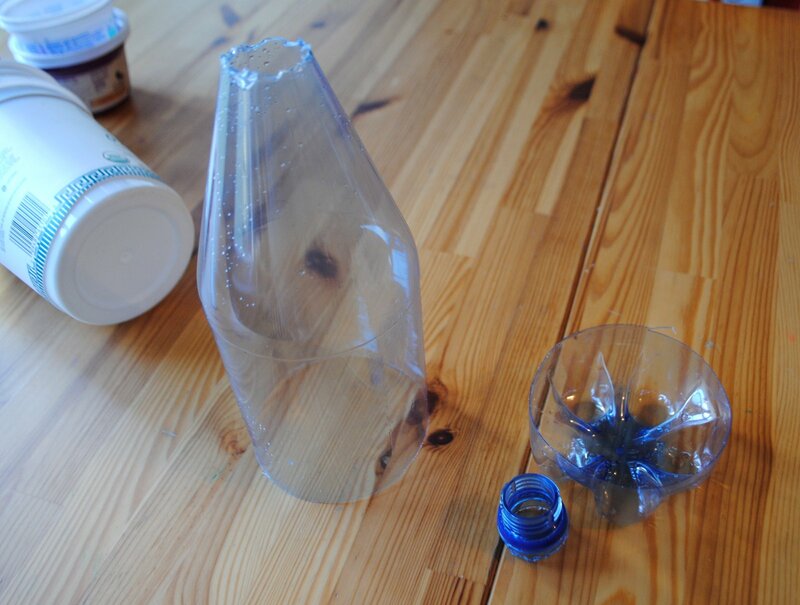 Then, use clear packing tape to secure the mobile strands onto the inside of the bottle, where they'll dangle freely. Step back and enjoy your new lantern!